Description: Packaging language is in English and French. 03-29-2019 tripredacus Description Packaging language is in English and French. This is a list of VGCollect users who have Need For Speed: Rivals - Complete Edition in their Collection. This is a list of VGCollect users who have Need For Speed: Rivals - Complete Edition in their Sell List. 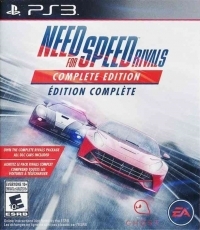 This is a list of VGCollect users who have Need For Speed: Rivals - Complete Edition in their Wish List.